The Wind Data Logger is designed to provide an affordable and easy-to-use solution to wind site evaluation and monitoring wind generator performance. It records wind speed, gust, and direction, time and date, temperature, battery voltage, and other important wind parameters. The Wind Data Logger is available in modules and packages and in self-contained systems for outdoor use. APRS World's PS2Tap is a powerful and cost effective tool for remotely monitoring the Bergey Excel wind turbine with Powersync II inverter. Installs inside the inverter, it wirelessly provides live Internet monitoring of the turbine production and inverter health. The PS2 Status Annunciator is a new module designed to remotely verify the operation of your PowerSync II inverter by communicating with your PS2Tap. Two very bright green LEDs remain on when the PowerSync II inverter is generating power or waiting for wind. The PS2 Status Annunciator is perfect for inverters located in barns and other locations that are visited infrequently. 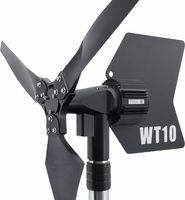 APRS World's WT10 micro wind turbine is the premiere wind generator for extreme wind enviroments. We have spent years developing and testing the WT10 in downright brutal locations and applications. Regular 150+ MPH winds, ice, and lightning. Every component of the WT10 has been repeatedly revised to make it as tough as possible and work in the most demanding enviroments. Simply put, there isn't a tougher micro wind turbine on the market. Besides the WT10 wind turbine, we manufacture turbine control panels, output cables, dump loads, tower components, specialized installation tools, and even highly innovative mounting structures for ISO shipping containers. With our years of experience in data acquisiton and control systems for small wind, we can offer both the most advanced and the most cost effective instrumentational, control, or telemetry systems. The XRW2G is APRS World's new data acquisition module for wind and weather sensors. Now available in four versions – Modbus™ / RS-485, APRS World / World Data / 802.15.4 XBee Wireless, RS-232, and USB– the XRW2G offers three digital anemometer inputs and eight analog inputs. The ThermokSolar-4A is a solar heating differential temperature controller for PV and DC powered applications. It is configured with four temperature sensor channels, an LCD display for real-time view and easy programming, and two solid state DC relay outputs. Designed to run directly from a PV panel, the ThermokSolar-4A is unique in the industry in that it requires no outside power. The ThermokLogger-4A is designed to provide an affordable and easy-to-use differential temperature controller for solar heating systems. It is a four channel 10K thermistor display and data logger with programmable solid state relay outputs. The Production Logger is an integrated data logging system for measuring grid tied renewable energy system input and output. This system is custom configured and built to order, so please call us to discuss your specific needs. APRS World produces tower components and accessories for small instrumentation and wind turbine towers. Data logger records wind speed, wind gust, and average wind speed at one minute intervals. Data is downloaded wirelessly from a laptop computer running the supplied software. Logger and anemometer mount on crane boom. No cables to run. Our Wind Monitor is used as a stand alone device when data logging is not needed. The easy-to-use interface includes a bright backlit LCD screen, which displays current wind speed and the maximum gust speed registered during the previous 60 seconds. APRS World, LLC offers sensor mounting booms in a variety of shapes and sizes. These can be customized to meet our customers needs, so call us to discuss the best solution for your application. Mounting Boom Kit, Bergey GL Tower, ½"
Mounting Boom Kit, SSV Tower, ½"
Masts and towers are also available. A beautiful white LED light for 12, 24, and 48 volt DC applications. 3.5" diameter anodized aluminum and frosted glass body looks great in home and industrial applications alike. Perfect for under counter lighting, but also great for task and room lighting. 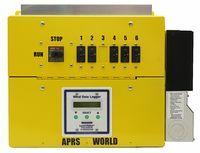 APRS World's DL300 series dump controller and load is an integrated solution designed to prevent 12 or 24 batteries from overcharging. We also offer a 600 watt modular dump load. The APO3 is a black box designed to prevent a vehicle battery from being discharged and damaged by a DC load. Typically, it is used to switch a radio transceiver off 10 minutes after the vehicle is shut off. Ideal for use with mobile APRS stations, the APO3 allows the radio to transmit a few position reports after the vehicle is shut off and then it turns off the radio and GPS to reduce clutter on the APRS channel and prevent the vehicle battery from discharging. Digi International makes a wonderful line of 802.15.4 XBee modems. They are fast, powerful, and reliable short range modems. The only downside to the modems is that they aren't readily available, having a lead time of six weeks or more. Faced with a long lead time and a short-deadline project, APRS World designed our own external USB modem that uses a Digi XBee-PRO modem. This product is functionally similar to Digi's XBee-PRO PKG modem package. We also offer an RS-232 potted modem and an Xbee to Ethernet gateway. Our favorite books about wind power. For anyone who is interested in a wind project, these are required reads.